Jim and I were on a mission to cook from home more and eat out less. The goal was to eat healthier, less processed food and fast-food. Making bread was one of the things we figured we would enjoy — especially if we explored beyond the traditional white bread loaf. So I set out to research and review bread machines, bread slicers, and bread knives. First things first, I had to make sure you could make more than your basic white bread — or wheat bread — in a bread machine. There are more than 300 bread machine recipes, so we won’t get bored making the same ‘ol thing every time. The extremely high number of positive reviews sealed the deal for us. 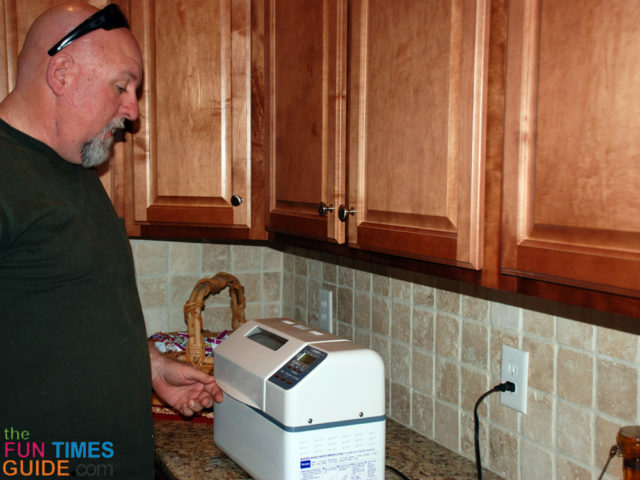 We love this bread machine. 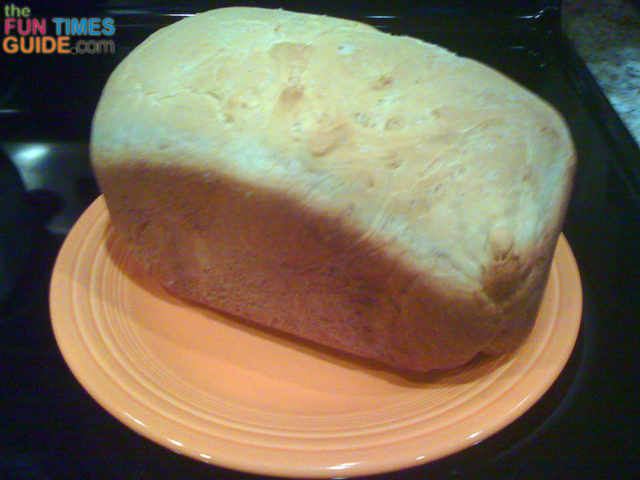 It has made perfect loaves of bread every time. And you don’t have to do anything extraordinary — just toss the ingredients inside the bread pan and turn it on! I can tell you… this bread machine is a cinch to use! While I sometimes dabble in the kitchen and manage to come up with some fairly good recipes sometimes, I’m no cook. And I’m definitely no baker! Trust me, this bread machine saves the day and makes you feel like a pro. 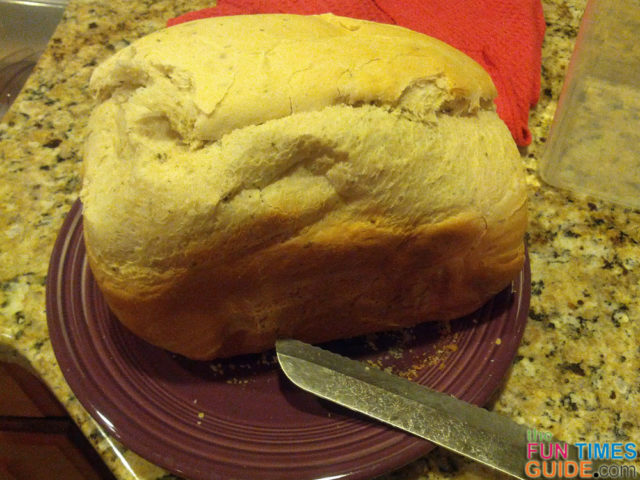 The bread turns out flawless every time. There are so many ways you can mix up the recipe to get different types of bread — so variety is never a problem. My favorite is banana bread, made with overripe bananas. I used to make it in the oven all the time, but using the bread machine is even easier. 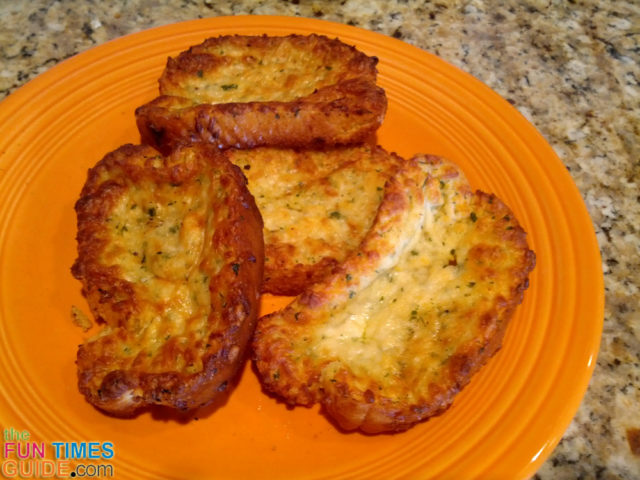 Jim’s favorite is Italian bread with herbs (…which I like to dip in an oil & herb mixture as a snack). I also like to cut thick slices off the loaf, coat them in garlic butter, cheese & herbs and bake in the oven til crispy — homemade garlic bread! After awhile, we decided if we were going to be making bread this often, then we might as well invest in the right tools for cutting and slicing bread as well. Option #1: We started out using an 8-inch serrated knife and a wood cutting board. Trust me, this isn’t the easiest thing to do with a loaf of fresh-baked bread. You end up pushing so hard on the top of the loaf to keep it steady, while you’re sawing back and forth trying to cut a reasonably sized slice of bread. Our bread slices always — yes, always — ended up way too thick. Thick is fine… sometimes. But you don’t always want a thick slice of bread — like when you’re making sandwiches. Thick bread for dipping and for buttering is great once in awhile — but not all the time. Thick is also good for french toast. But generally, we prefer thinner slices of bread. Unfortunately, we found it almost impossible to cut ‘normal’ thin slices of bread with a regular knife and cutting board. Option #2: We tried an electric knife (we already owned this one), but it just seemed like a lot of trouble to slice off a piece of bread each time. Who keeps their electric knife handy on the counter day in and day out? Not us. While the electric knife did cut the slices of bread more uniformly, it was kind of messy — with bread crumbs flying in every direction — and loud. Suddenly homemade, fresh sliced bread turned high-tech and felt less glamorous than homemade bread should. 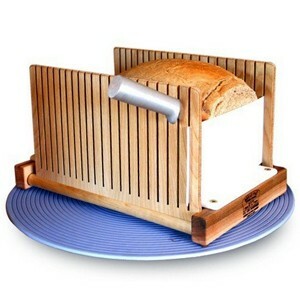 Option #3: We finally decided to invest in a bread slicer. The goal was to find one that allowed for adjustable sizes per slice — at least a thicker option and a thinner option, if nothing else. We also wanted a way to stabilize the loaf of bread while we were cutting it. I was completely shocked to find that there were no stores in my area selling bread slicers — not even Williams Sonoma. They have a nice bread board with crumb catcher, but it’s about the price I wanted to pay for a slicer and a board. So I passed. At other stores, store clerks looked at me like I was from another planet when I asked if they could show me where where the bread slicers were. So I took my search online. Amazon is my favorite place to find things — because I like to see what people who actually own the product think. The reviews are priceless in my opinion, and Amazon always seems to have the most (genuine) reviews on products. I knew that I wanted a very sharp, serrated knife for slicing bread evenly. Because what matters most when cutting bread is the depth of the serrations. 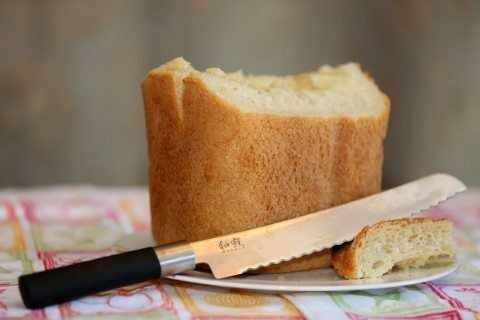 I’ve heard that longer knives are better when it comes to slicing bread — especially if you’re using it in a traditional bread slicing guide. 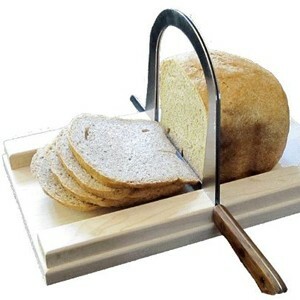 People seem happier with 10-inch and 12-inch bread knives when cutting bread. So I started by looking at the best-selling bread knives on Amazon. Here are some more excellent tips for slicing bread. Ho hum… it appears that there may not be one single knife that is best for slicing bread. Here are some tips for choosing a good bread knife.